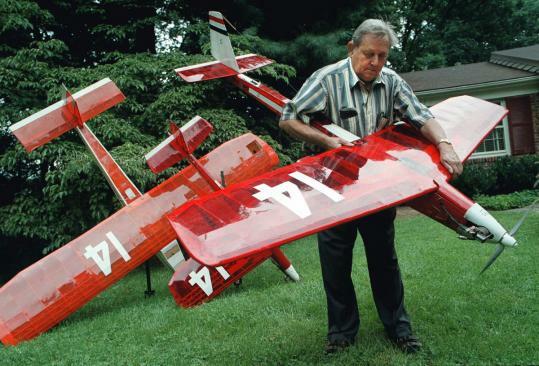 WASHINGTON — Maynard Hill, a designer of model airplanes who secured a spot in aviation history in 2003 when one of his creations flew 1,882 miles across the Atlantic Ocean on less than a gallon of fuel, died Tuesday of prostate cancer at his home in Silver Spring, Md. He was 85. A balsa-and-glue virtuoso, Mr. Hill was a legend in the model aircraft world even before his first-of-its-kind trans-Atlantic feat. Beginning in the 1960s, he set 25 world records for speed, duration, and altitude, flying his radio-controlled aircraft as high as 26,990 feet, as long as 38 hours, and as fast as 151 miles per hour. Professionally, Mr. Hill was a metallurgist in the Applied Physics Laboratory at Johns Hopkins University who eventually convinced his supervisors that he should be allowed to indulge his hobby at work. He became a pioneer in developing unmanned aerial vehicles, drones, for the military. He was retired, legally blind, and mostly deaf in the 1990s when he announced at a meeting of the D.C. Radio Control Club that he intended to fly a model airplane across the Atlantic, from the Canadian province of Newfoundland to Ireland. With the exception of Mr. Hill, no one thought it was possible. According to international rules, a plane must weigh less than 11 pounds, including fuel, to qualify as a model. No such plane had flown even a third as far as Mr. Hill was proposing. Nevertheless, a group of other retired engineers and computer programmers soon joined the mission, swayed by Mr. Hill’s optimism and track record. Working in his basement shop and using special glasses and glue dyed red for better visibility, Mr. Hill perfected a tiny four-stroke engine that ran on camp-stove fuel, sipping just two ounces per hour. He mounted it on a balsa and Mylar skeleton with a 6-foot wingspan. He did this over and over, building 29 versions of his design, the first 24 of which failed, crashed, or disappeared in flight. Meanwhile, Mr. Hill’s team helped raise tens of thousands of dollars. It perfected a computerized autopilot system to guide the aircraft on its long journey. And crewmembers flew Mr. Hill’s prototypes on countless test flights at a Montgomery County, Md., horse farm owned by Beecher Butts, an octogenarian aviation enthusiast. In 2002, after four years of full-time work, the team traveled to Cape Spear, Newfoundland, for a first trans-Atlantic attempt. It was a disaster. Three planes went in the drink, two of them after traveling less than 30 miles. The computer experts on the team discovered a fundamental flaw in the navigational software. Mr. Hill, undaunted, urged everyone not to give up. After 12 more months of tinkering, the team returned to Canada. Mr. Hill threw his 25th plane, javelin-like, eastward. A tiny computer in the plane’s innards relayed information about its location and altitude. It behaved oddly, dipping and rising in an unpredictable fashion and at one point failing to communicate its position for three hours. Everyone lost heart, including Mr. Hill. But the plane, dubbed the Spirit of Butts Farm, eventually reappeared on tracking devices and flew steadily, arriving at its designated target on Ireland’s west coast after 38 hours and 52 minutes of flight. Members of the US-based Academy of Model Aeronautics were there to guide it to a safe landing via radio control. “In the model airplane world, this is no different from Armstrong landing on the moon,’’ Carl Layden, an official observer of the feat, told the Baltimore Sun at the time. Mr. Hill heard of the landing by phone. Less than two ounces of fuel remained in the tank.